CANVAS lacquer: More holo! More floral! If you follow the canvaslacquer Instagram account you may have seen this a few days ago. I'm kind of new to this whole nail social media thing, so I'm happy to report this has so far been my most 'liked' look. I started with 2 coats of a-England Her Rose Adagio. Not sure why the pink doesn't really come through in photos, but it's a beautiful shade (and I'm not typically big on soft pink). For added interest I dabbed on a bit of a-England Dancing with Nureyev. The blue seems to read a bit better than the pink, but overall it comes off sorta silvery. 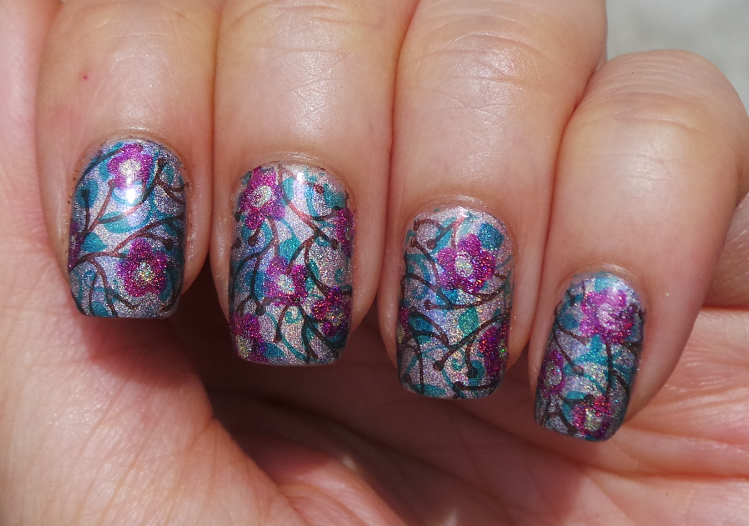 For the branches I used a-England Briarwood, an amazing brown holo that also stamps beautifully. 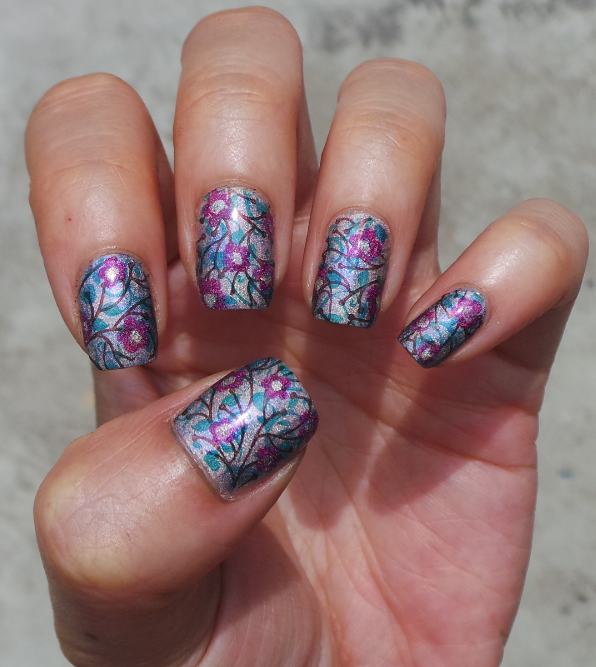 I used Vivid Lacquer plate 014. Next for the leaves I used Pueen 33 with my usual OPI Amazon...Amazoff, the only non-holo polish for this look, I have plenty of green holos that probably do stamp well, I just thought it might clash too much with all the other holo going on so I opted for a creme. 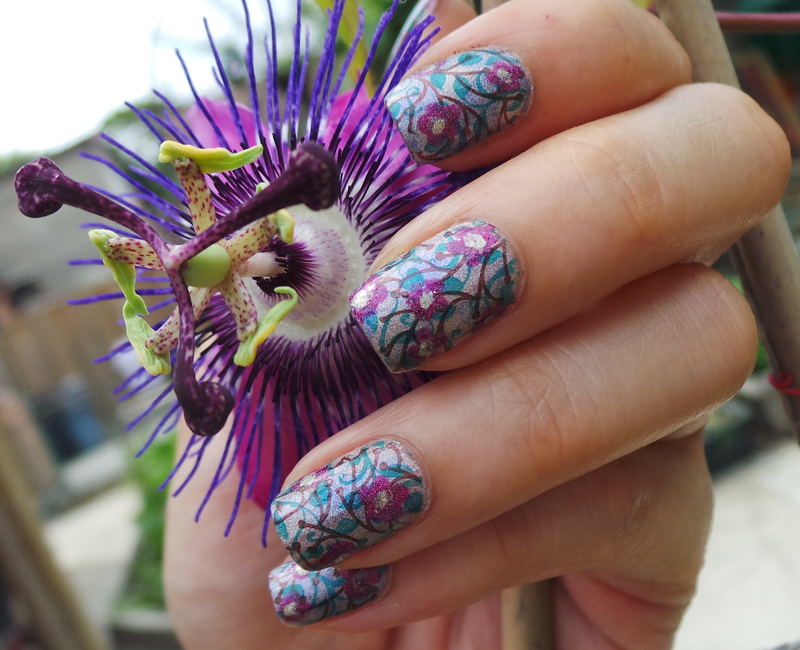 Finally, with a dotting tool for the flowers I used Colors by Llarowe OABTRAD. The little centers are Color Club Kismet. I've been trying to incorporate more visual interest in my nail pics, but I find holding an item and positioning my hand for the photo at the same time incredibly awkward! So here's a rando photo of me trying to pose with one of my passionflower vines. Do you guys prefer JUST the nails or do like seeing someone posing with something?